KIEV, Ukraine -- Ukraine has a new government ministry. This month, the parliament voted to create a ministry of information policy that will be led by Yuriy Stets, the head of the information security department of the national guard. 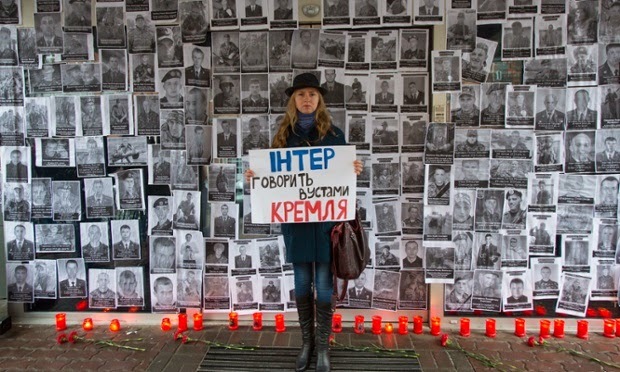 A Ukrainian activist protests against a Russian propaganda TV series. According to the new minister, the information war against Russia cannot be won without it. But in resorting to such measures, does Ukraine not risk losing its battle for democracy? Almost no one in Ukraine doubts that Russia is waging a propaganda war. The Russian actors Mikhail Porechenkov and Ivan Okhlobystin have become notorious [for supporting the separatists], and Ukrainians approve of the fact that their popular Russian TV serials were recently banned. But the idea that the government should oversee the information sphere was not universally welcomed. It had to be forced through parliament, with deputies called upon to vote on the composition of the cabinet as whole rather than individual ministers. “We have not seen the details and we do not know what sort of monster we are creating”. Despite many abstentions, the law was passed. The deputies had cause to be cautious. Under the terms of its creation, Stets’s ministry will receive wide powers to influence the media: officials will formulate and implement a “state information strategy” and take measures to protect citizens from “partial, ill-judged and unreliable information” and from manipulative technology. Its purview extends to registering media outlets and defining professional standards. But Stets will wield carrots as well as sticks. His department will coordinate “state aid for the media” and attract investment in order to create a “national information product”. What exactly hides behind this vague formulation is a matter of guesswork but Ukrainian activists are already tipping the ministry for a corrupt future. They are far more worried, however, by the prospect that freedom of speech in Ukraine might be curtailed. 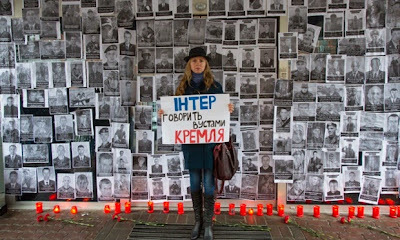 The Organisation for Security and Cooperation in Europe has warned of this threat, as have the Ukrainian Helsinki Human Rights Union, journalists from Sumy Oblast and their colleagues from Kirovohrad, who organised a demonstration. It is easy to understand their feelings. A similar ministry existed in Ukraine under former president Leonid Kuchma. Its time was marked by the death of the journalist Georgiy Gongadze. Kiev insists, however, that the creation of the ministry is as essential as it is timely. “The main function of this ministry, as far as I am aware, is to prevent an attack on Ukraine from an assailant”, said the president, Petro Poroshenko. He is echoed by a bevy of functionaries and deputies. “A year ago, I proposed that a ministry of propaganda be created”, said Sergey Kaplin, a deputy from Poroshenko’s bloc. “It would simply destroy separatism as a phenomenon as soon as it appeared in [Ukraine]”. Stets promises that his department will be dissolved as soon as the war ends. There is something to be said for their line of reasoning. One way or another, the Russian media has played a notable role in plunging Donbas into crisis: recall the inflammatory articles by Darya Aslamova, for instance. It is no accident that immediately after seizing the regional administration in Donetsk, the separatists took control of the TV towers. You used to be able to defend Russian media in Ukraine by appealing to the need for pluralism but now, after Russian state TV presenter Dmitry Kiselev and his ilk broadcast stories about boys being crucified and slaves distributed among the national guard, that is no longer possible. What is more, the scale of the Russian propaganda campaign is exercising NATO and Kiev is obliged to support its western allies. But in combating aggression from abroad, Ukraine risks curtailing press freedom at home. The ministry of defence recently tried to limit journalists’ access to the “zone of anti-terrorist operations”, insisting that they be accompanied by soldiers. Fearing a scandal, the ministry later rescinded the order, or at least postponed it, but it left a bad taste in the mouth. An incident involving journalist Dmitry Mendeleev also springs to mind: he wrote an article [accusing] government bodies of selling weapons on the commercial market at time of war. Poroshenko himself asked the general prosecutor to deal with the journalist’s “subversive activity”. There are fears, therefore, that the ministry of information policy is being created not so much to combat an external enemy as to suppress internal opposition. If that is indeed the case, Ukraine will drift off in the same direction as Vladimir Putin’s Russia. While accusing the Kremlin of propaganda, Kiev is itself trying to create a hermetically sealed sphere of information. It is not hard to imagine how destructive the consequences might be. But the question is, does it have any real alternative? It is no secret that Russia’s propaganda machine is much more effective than Ukraine’s. Even under former president Viktor Yanukovych, the authorities didn’t manage to control the media: the opposition press stirred up rebellious sentiment and it all ended with the fall of the regime. A similar situation remains in Ukraine today. Heightened expectations mean that the new government is criticised even more than the old one. The economic crisis breeds subversion. The possibility that support for Poroshenko will fall to critical levels over the next year cannot be ruled out. But with the war ongoing, unrest in the rear might spell catastrophe – not only for the current authorities but also for Ukraine as a whole. That is why Kiev [feels it] must surrender democratic principles in the name of stability. No less important to Kiev is the restoration of legitimacy in the eastern and southern regions. Here, again, it will not be possible to get by without tough counter-measures. No matter how much bloggers from the capital make fun of [Russian TV channels] Lifenews and Channel 1, millions of Ukrainians have internalised the clichés of Russian propaganda. Phrases such as “Maidan coup”, “national guard punishers” and “Kiev junta” have embedded themselves in the lexicon of inhabitants in the south and east. Restoring the legitimacy of the Ukrainian authorities while also respecting diversity of opinion will therefore be devilishly difficult. Clearly, it will involve replacing one set of propaganda clichés with another but, for now, Kiev may have no other option. It appears that the prolonged conflict is assuming similar features on both sides of the fence. Faced with an armed opponent, pacifist games must be set aside or your chances of survival diminish tragically. But there is a cost to everything. The possibility that a [propaganda journalist] such as Vladimir Kulistikov or Dmitry Kiselev will soon appear in Ukraine cannot be discounted. On the other hand, there is hope that the ministry of information policy represents nothing more than a vacancy created to give Stets a job. But in that case, how can we expect Ukraine to hold its own in the war of information?